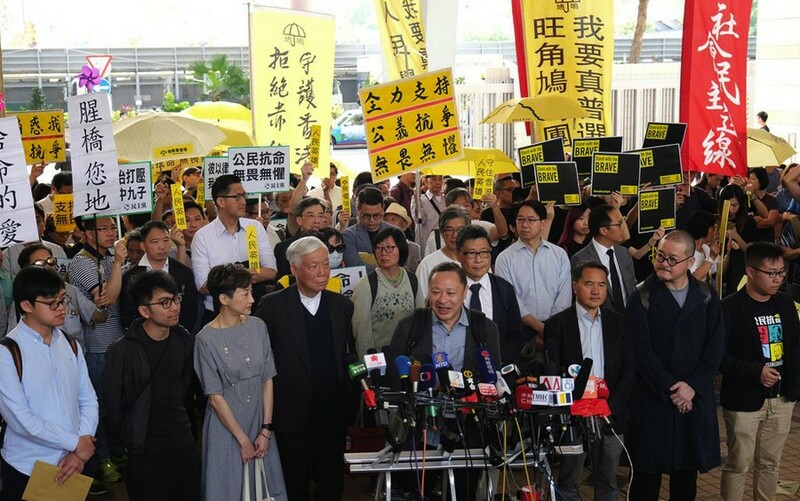 A delayed verdict was made yesterday when the District Court convicted nine pro-democracy activists for their roles in the 2014 Occupy protests that demanded democratic reforms to elect the SAR's leader via universal suffrage. The convictions were inevitable. After all, nobody truly believed any of the accused would be acquitted, after so many youngsters - and police officers - were sentenced and jailed because of what had happened during the protests. The prosecution had laid a number of charges and one or two of them were bound to stick. In finding them guilty, Judge Johnny Chan Jong-herng said civil disobedience was recognized in the city, but it could not be used as a defense in the current case. He referred to the widespread obstructions to traffic, saying they were unreasonable and unjustified. Occupy cofounders law professor Benny Tai Yiu-ting and retired sociology professor Chan Kin-ming chose not to submit mitigation letters, but pleaded with the court to spare cofounder pastor Chu Yiu-ming from jail due to his health. That Tai and Chan didn't seek mitigation may be read as either a show of defiance of the conviction, or an acceptance of responsibility for civil disobedience. The various charges - conspiring to cause a public nuisance, inciting others to cause a public nuisance, and inciting people to incite others to cause a public nuisance - carry a maximum of seven years in prison. How many years will be meted out? Society is watching with concern. Historically, the fight for democratic development has been intertwined with imprisonment. In South Africa, anti-apartheid movement leader Nelson Mandela spent 27 years in different prisons before being released by the white government, to pave way for national reconciliation allowing everyone regardless of their skin color to elect their leader. The former prisoner then became the nation's first president. It's also common to see dissidents and civil rights advocates being incarcerated in the mainland. The most notable was writer and Nobel Peace Prize winner Liu Xiaobo, who was locked up for years until 2017. He was released on medical parole in June that year, and died a month later. Meanwhile, his wife Liu Xia had also been placed under house arrest for a long time before she was permitted to leave the country to immigrate to Germany. The Occupy protests were launched to pursue the fulfillment of the promise to give the people of Hong Kong the right to elect the chief executive through universal suffrage. The protests obviously failed to achieve the aim, as the chief executive is still elected by a small circle known as the Election Committee - with Beijing holding the right of final approval. People critical of the Occupy protests aren't entirely Beijing loyalists, but also include quite a number supportive of the democratic cause, but disagreeing with the occupation tactics. If a compromise had been reached a few years ago to allow Hongkongers to choose from among two or three candidates filtered by Beijing in advance, would the situation be better than what it is now? Yesterday's convictions were inevitable, but it isn't for the court to answer the question of democratic development.